Christmas Panto – Get your Tickets NOW ! The much-acclaimed Comrie Panto team, led by the Rev Graham McWilliams, is frantically trying to master their lines and moves, paint the scenery, plan the makeup, prepare the costumes, hire equipment, print the tickets, make the props, master the music, work out the sound and lighting, design the set, organise the raffle refreshments and front-of-house and do all the rest of it. Fire regulations mean lower capacity this year so buy your tickets early. We are experimenting with a single ticket outlet – the White Church – this year and if you have difficulty in getting tickets you can ring Ted Henderson on 07871942164. On the performance nights, to hope to avoid the usual chaos, we will not let any of the audience through the doors before 7 o’clock and we would ask big people to try to avoid populating the front seats to allow small people the chance of a good view. 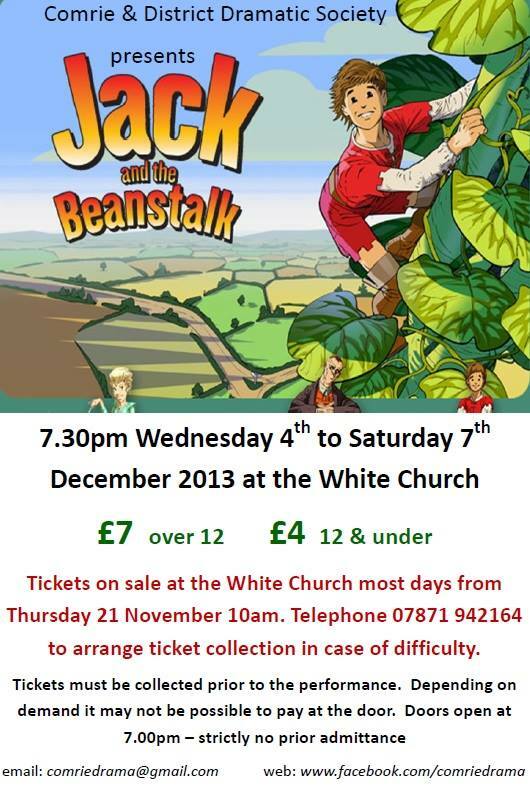 From Wednesday to Saturday 4th to 7th December at 7.30pm at the White Church, tickets cost £7 for over 12s and £4 for 12s and under. We provide free refreshments at the interval.